Ancient Egyptian Gold At HMNS! The crazy thing about our Hall of Ancient Egypt is that every object has an amazing story behind it and there’s just so much to see that it’s easy to overlook some pretty fascinating pieces. Part of the mission of the Beyond Bones blog is to bring the little things to the big public. Here, all those fascinating little pieces that tend to get overlooked have their moment in the limelight. Case in point: this little golden statuette of Herishef. The artifact is only about four inches tall, but it’s golden sheen has managed to capture the eye of many a visitor despite the its location in a crowded case hidden in a dark corner. It was originally found with a silver shrine, and is fitted with a loop so it can be worn as an amulet. Herishef is a very ancient, but somewhat overlooked Egyptian god. He is associated with fertility and the creation of life. His name means “he who is on his lake”. He is believed to have emerged from the primordial marshes of earth’s creation and is often associated with Osiris, the king of the underworld and the god of vegetation, and Re, who ferry’s the sun across the sky every day and through the underworld at night. In the case of our statue, the association is with Osiris. You can tell by his head dress, called the “Atef” crown. Osiris is almost always depicted wearing it. Why would Herishef be depicted wearing a piece of another god’s costume? Well, for the ancient Egyptians gods represented natural forces and abstract ideas. It was not unusual to combine the qualities of two gods into one symbolic artifact representing a new idea. The Egyptian civilization was around for a long time, so they had to adapt their gods to the changing perceptions of the Egyptian people about the world around them, and this is one way that was accomplished. 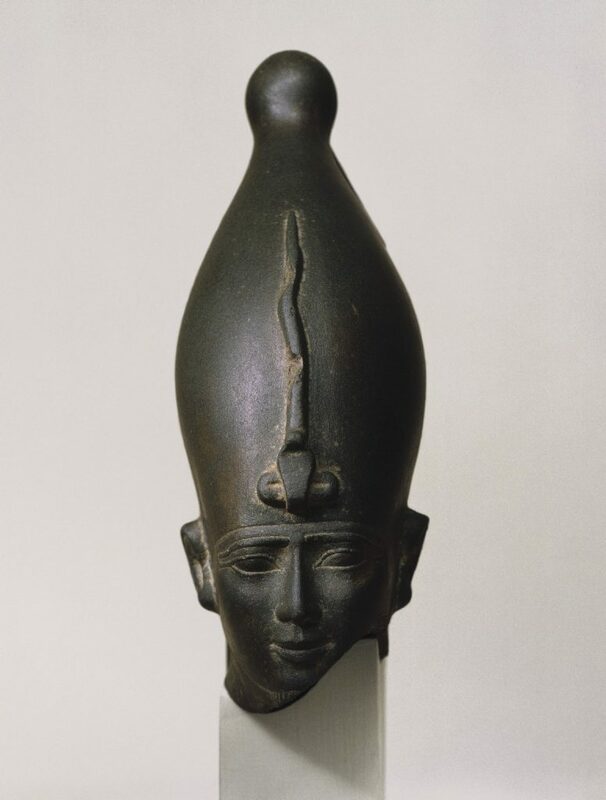 Head from a statue of Osiris, wearing his Atef crown. Author: Brooklyn Museum. Source: Wikimedia Commons. Herishef was worshiped from at least the first Intermediate Period (c. 2181-2055 BCE) through to the Roman era. In fact, a stelae dedicated to Herishef was discovered at the Temple of Isis in Pompeii. 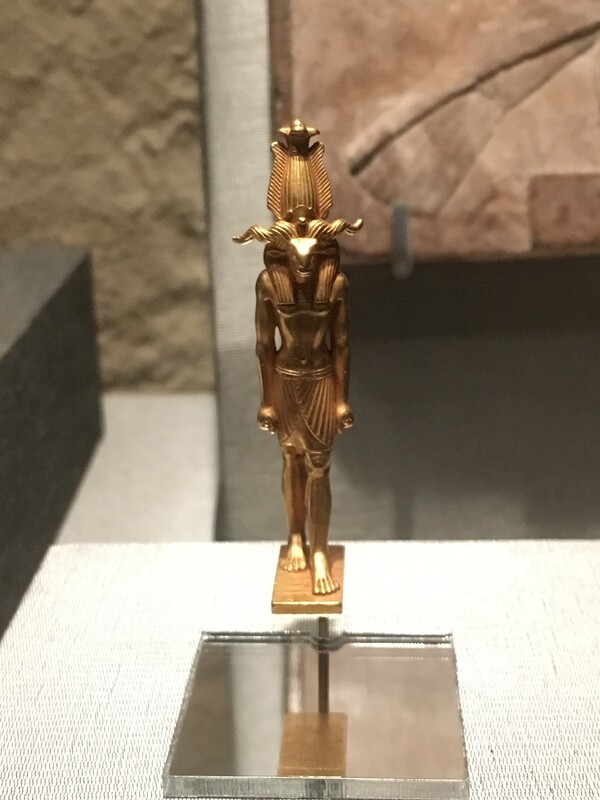 The golden statuette on display in our Hall of Ancient Egypt was discovered by the famous Egyptologist Flinders Petrie circa 1904 in the remains of the great temple of Herishef, located in the ancient city of Herakleopolis, the cult center of the ram-headed god. 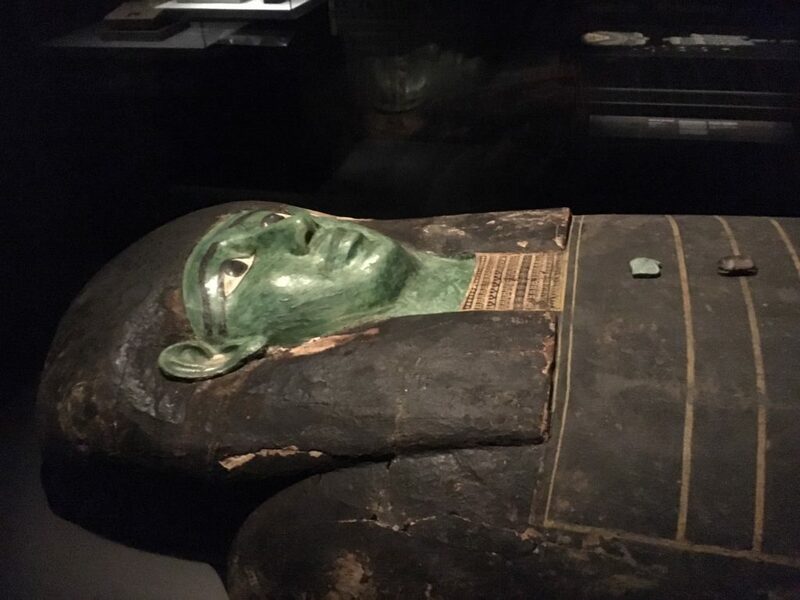 In an interesting twist of fate, we happen to have the lid to the massive coffin of a priest devoted to Herishef, named Ankhemmaat, in another section of exhibit. Stay tuned to the Beyong Bones blog for more glimpses into the fascinating history of those harder-to-spot objects. And don’t forget that you’re always welcome to come see our amazing exhibits for yourself! Admission to HMNS if free every Thursday during the summer from 3-6pm! The statue discovered by Petrie is indeed on display here. It’s on loan from the MFA Boston and will go back eventually. We do not have the silver shrine, and actually I’m not even sure that Boston has it. I will have to confirm with our Curator of Anthropology when he gets back from an international trip next week.